“I am a warrior.” These were the uncompromising words that George Washington chose to describe himself in May 1779, at the height of the Revolutionary War against Britain. It’s an image very different to the one that he’s been assigned by posterity – the patriotic plantation owner who would become the dignified political leader of his country. This book focuses on a side of Washington that is often overlooked: the feisty young frontier officer and the tough forty-something commander of the revolutionaries’ Continental Army, not the venerated elder statesman of the Republic. It examines Washington’s long and chequered military career, tracing his evolution as a soldier, and his changing attitude to the waging of war. A central narrative anchored upon Washington’s own experience is combined with analysis of the background influences that shaped his conduct as an officer. Ironically, it shows how Washington’s reliance upon English models of ‘gentlemanly’ behaviour, and on British military organisation, was crucial in establishing his leadership of the fledgling Continental Army, and in forging it into the weapon that won American independence. 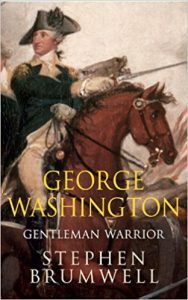 George Washington: Gentleman Warrior is a vivid recounting of the formative years and military career of ‘The Father of his Country’, following his journey from brutal border skirmishes with the French and their Indian allies to his remarkable victory over the British Empire, an achievement that underpinned his selection as the first president of the United States of America. Drawing on a wide range of sources, including original archival research, Stephen Brumwell paints a compelling and challenging portrait of an extraordinary individual whose fusion of gentleman and warrior left an indelible imprint upon history.